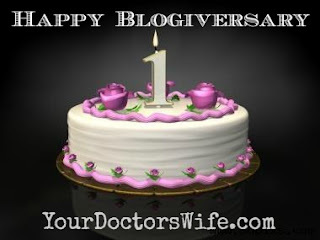 Your Doctor's Wife: Happy Blogiversary to Me! I want to thank all of you who read, comment, and email me. It's heartwarming to know I have engaged and entertained you. When I first started this blog, I doubted I'd ever find readers. shaving some bucks of my therapy bill. and I thank you so very much. Happy blogiversary! It has been great to find your blog and connect with you over the past year. Here's to many more blogging years together! 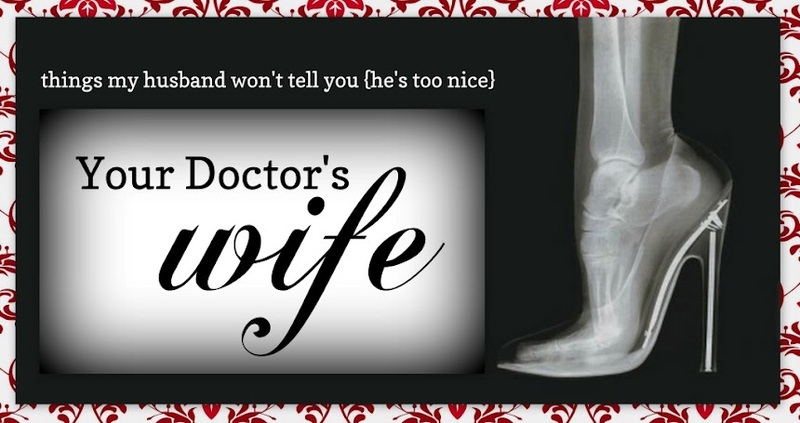 Cheers to a great year of thoughts, wisdom and fun reads from Your Doctor's Wife. Although I have only followed for a few short months I know we have many, many more exciting years together in this blogosphere. Happy Blogiversary! Congratulations! Here's to another one filled with your entertaining stories! Thanks, Gina! I appreciate all the support you've given me this past year! Thank you! If you ever have a question, email me! Happy 1 year! SO glad you made the decision to start a blog 1 year ago- I love reading your posts! Thanks so much! I love writing them, so I'm so always so happy to hear someone is reading! Thanks and here's to more Medical Mondays and meeting more medlife peeps! Happy 1 year and well done for producing some interesting and extremely humorous posts. Look forward to the next year! Thank you so much! I love hearing that I was able to entertain a bit! Thank you! I'm quite fond of my header as well. Michelle at http://shinethislight.com/ did a fantastic job!! !